On February 5, an international trade union delegation of representatives of the IUF, our sister internationals PSI and IndustriAll and the ITUC delivered a letter to the government of Algeria at the country's Geneva embassy condemning the ongoing repression of independent trade unions. In addition to the new cascade of lawsuits directed against Raouf Mellal, president of the independent energy union SNATEGS, the union's general secretary Abdelkader Kawafi now also faces prosecution for 'defamation'. Kaddour Chouicha, national coordinator of the independent education workers' union SESS, comes to trial the same day as the SNATEGS general secretary, for alleged 'incitement' to unauthorized assembly. 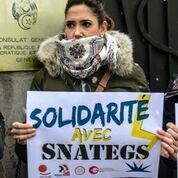 SNATEGS and SESS are members of the Independent General Confederation of Workers in Algeria CGATA, which the government refuses to recognize. On January 20, the Algerian police forcibly broke up a rally in the capitol city Algiers organized by SNATEGS, arresting over one thousand peaceful protestors and detaining them in remote areas for ten hours after confiscating their phones and deleting evidence of the police action.